WASHINGTON (CNS) — Consecrated men and women reflect the light of Christ and are witnesses to that light “in a world that is often shrouded in shadow,” Cardinal Joseph W. Tobin of Newark, New Jersey, said Jan. 29. “They are the glory of God’s people. We pray for the perseverance of consecrated men and women and ask God to continue enriching the church with their unique vocation,” he said in a statement as the chairman of the U.S. Conference of Catholic Bishops’ Committee on Clergy, Consecrated Life and Vocations. Cardinal Tobin’s statement came in advance of the annual celebration of World Day for Consecrated Life Feb. 2, the feast of the Presentation of the Lord. It will be celebrated in parishes the weekend of Feb. 3-4. The feast of the Presentation also is known as Candlemas Day, when candles are blessed to symbolize Christ as the light of the world. St. John Paul II instituted the day of prayer for women and men in consecrated life in 1997. With his statement, the committee headed by Cardinal Tobin also released the results of a survey of women and men religious who professed perpetual vows in 2017 in a religious congregation, province or monastery based in the United States. The survey was conducted by the Center for Applied Research in the Apostolate, based at Georgetown University in Washington. — Nearly nine in 10, or 86 percent, of the responding religious said they regularly participated in some type of private prayer activity before they entered their religious institute. About two-thirds participated in eucharistic adoration, prayed the rosary, or attended retreats before entering. Nearly six in 10 participated in spiritual direction before entering. — One-half of responding religious attended a Catholic elementary school, more than four in 10, or 44 percent, attended a Catholic high school, and a near equal proportion, or 43 percent, attended a Catholic college before entering their religious institute. — On average, the responding religious reported that they were 19 years old when they first considered a vocation to religious life, but half were 18 or younger when they first did so. — Nearly nine in 10, or 87 percent, of the responding religious reported that someone encouraged them to consider a vocation to religious life. Over four in 10, or 43 percent, said that a parish priest encouraged their vocation. Half said they were encouraged to consider a vocation by a religious sister or brother; women religious were more likely than men religious to say so. Over four in 10, or 41 percent, reported that they were encouraged to consider a vocation by their friends. 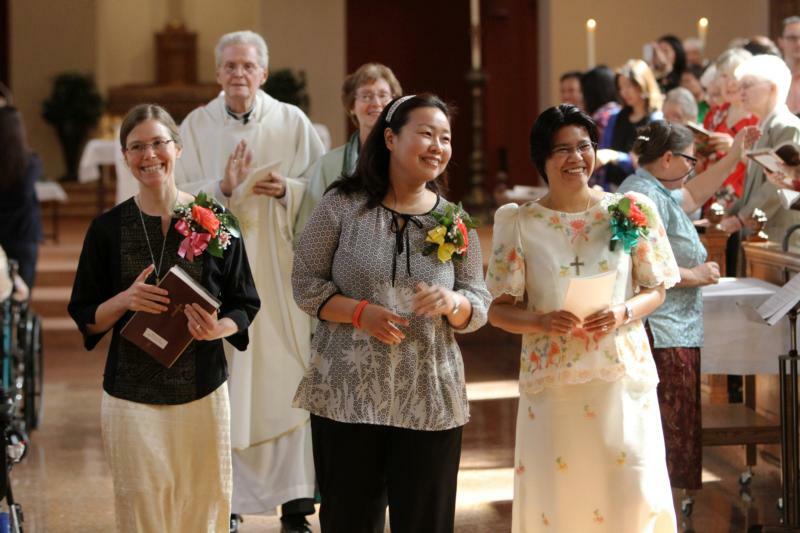 CARA asked the 768 religious institutes, provinces or monasteries that are in the United States to provide the names of women religious or religious brothers and priests who professed or were planning to profess perpetual vows in 2017. The institutes, provinces, etc. were identified by the Leadership Conference of Women Religious, the Council of Major Superiors of Women Religious, the Conference of Major Superiors of Men or the USCCB Secretariat of Clergy, Consecrated Life and Vocations. A total of 600 major superiors responded, or 78 percent, with the names of 208 men and women religious. Of that number, 100 sisters and nuns and 51 brothers and priests responded — representing a response rate of 73 percent. The average age of responding religious is 41. Half of the responding religious are age 36 or younger. The youngest is 24 and the oldest is 86. Two-thirds of the respondents, or 64 percent, identify as white; more than one in six, 18 percent, identify as Asian; and more than one in 10, or 11 percent, identify as Hispanic. Sixty-seven percent of the respondents were born in the United States. Of those born outside the U.S., the most common country of origin is Vietnam. Among those identifying as Hispanic/Latino, almost six in 10 — 62 percent — are foreign born. Of those identifying as Asian/Pacific Islander/Native Hawaiian, seven in 10 are predominantly foreign born. Six percent identify as African-American/black. Ninety-four percent, or nearly all, who identify as Caucasian/white are U.S. born. — Nearly nine in 10 of the responding religious, or 88 percent, have been Catholic since birth. More than three-quarters — 77 percent — come from families in which both parents are Catholic. Among the 12 percent of respondents who became Catholic later in life, the average age at which they did so was 22. — Half of the respondents attended a Catholic elementary school, which is a little higher than that for all Catholic adults in the United States — 50 percent vs. 39 percent. These respondents also are more likely than other U.S. Catholics to have attended a Catholic high school — 44 percent of responding religious, compared to 19 percent of U.S. adult Catholics; and they are much more likely to have attended a Catholic college — 43 percent of responding religious, compared to 10 percent of U.S. adult Catholics. — The survey found the profession class of 2017 is highly educated, with 25 percent of responding religious earned a graduate degree before entering their religious institute. More than two-thirds — 69 percent — entered their religious institute with at least a bachelor’s degree. — Most religious did not report that educational debt delayed their application for entrance to their institute. Among the 4 percent who did report having educational debt, however, they averaged about four years of delay while they paid down an average of $29,100 in educational debt. — Nearly all of the responding religious, 88 percent, participated in some type of vocation program or experience prior to entering their religious institute.